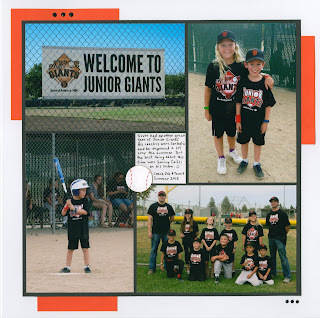 Trevor has been participating in Junior Giants for three years now. I can't say enough good things about the program. It's pretty much everything I think sports should be, but sometimes isn't. I love that it emphasizes teamwork, leadership, confidence, integrity and health. 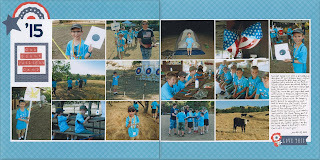 I love that it is non-competitive and that every child is encouraged to do his or her best. And speaking of his or her best, I love that it is co-ed, because Trevor's good friend Cailei was on his team this year! We're already looking forward to Trevor's 4th year of Junior Giants! We absolutely adore our house rabbit, Trouble. Last year, I shared A Day in the Life of Trouble deRosier, which is a great place to start if you've ever wondered what it's like to keep an uncaged rabbit as a pet. (Spoiler alert: It's awesome.) I'd also encourage you to check out the rest of my rabbit-related posts, including rabbit-inspired crafts, foods and more. Here's a quick and easy treat to make with the kids to celebrate International Rabbit Day. It's from Jacques Pepin, one of my all-time favorite TV chefs. Be sure to watch to the end. My sister-in-law, Lisa, is a travel agent who specializes in cruises. When she recently traveled to the Mediterranean, she asked if I'd like her to bring me back an interesting food. I'm not sure why she even asked. OF COURSE I want an interesting Mediterranean food!! 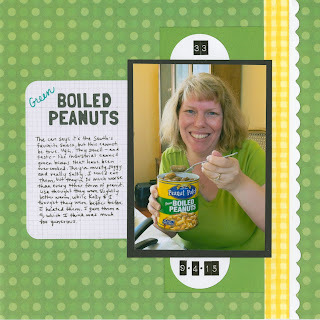 She attended my most recent new-to-me luncheon, where we tried Pichuberries and Green Boiled Peanuts. The third item we tried was the White Balsamic Cream she brought back from Greece. It was flavored with orange and lemon and it was spectacular. We tried it on raw veggies, crackers and fruit and it was excellent on all of them. I honestly think it might go with everything! I gave it a rare perfect 10. So did Kelly, who was very disappointed to hear that she'd need to go to Greece in order to purchase some. Lisa rated it a 9. It was really, really good. I had some fun with the layout, making a ransom note inspired title from seven different partial sticker sheets. I don't like mixed-font titles when there are multiple colors also, but I don't mind (too much) if either the font OR the color is varied within a word. 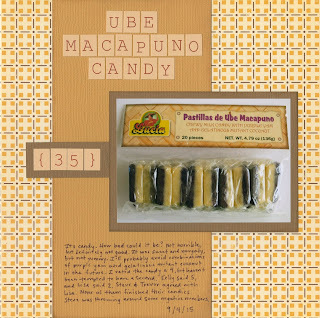 I'll share new-to-me food #35 on Monday. Then only 8 more until I've finished the project, with almost 6 months to go. I'm pretty sure I'm going to be trying new foods beyond just 43. This has been too much fun to stop now. It's been a year (to the day - weird!) since I last blogged about my jobs. 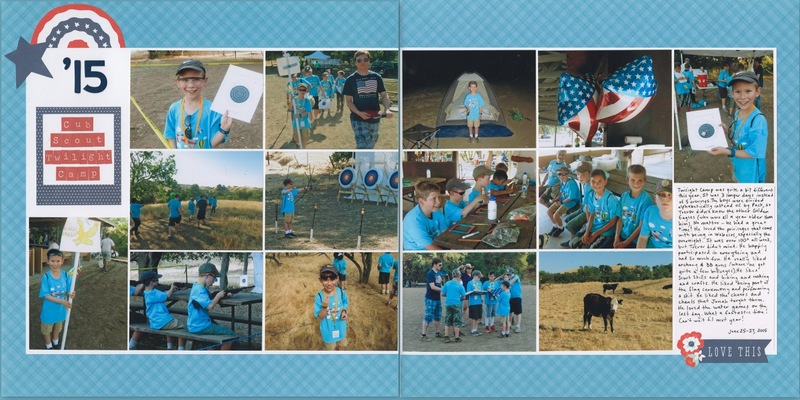 Not much has changed with my Scrapbook.com job. 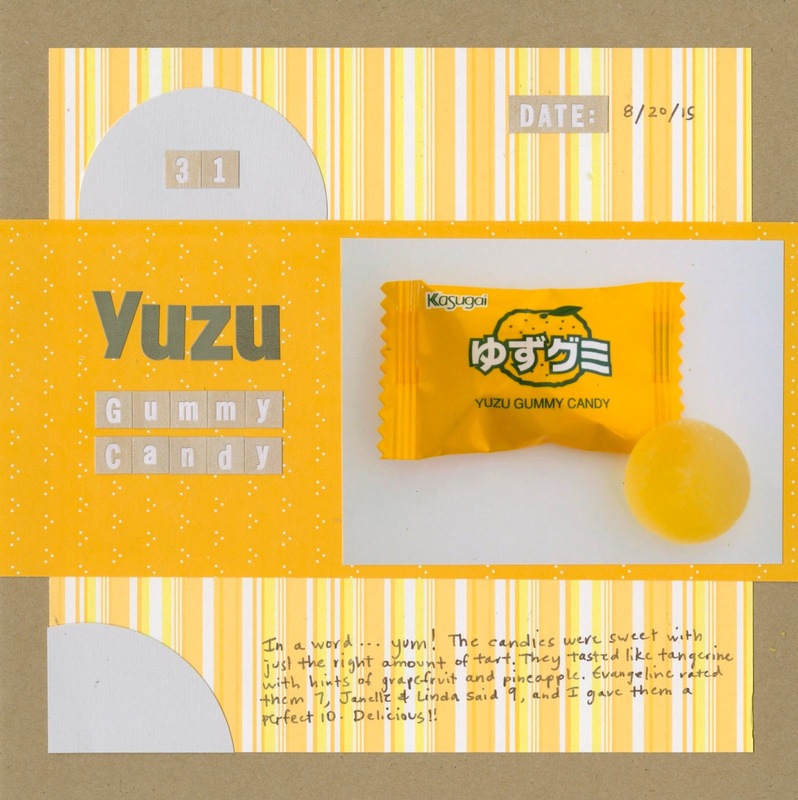 I'm still writing product descriptions, both creating text for new products just entering the store and improving the copy on existing products. From item to item, it's either very easy or very difficult, depending on how familiar I am with the product and how thorough the information the manufacturer has provided. 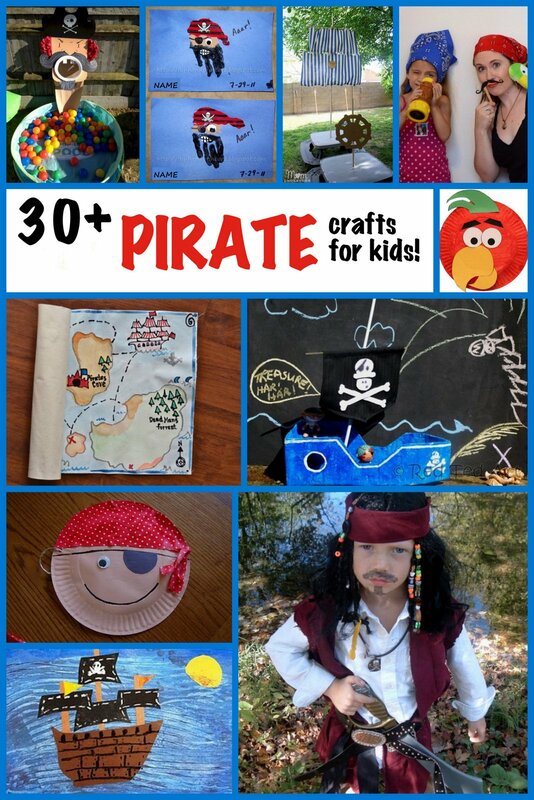 In contrast, my job at Fun Family Crafts has continued to change and grow. 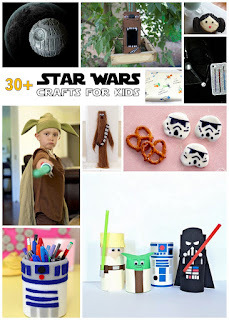 When I started in December 2012, my job was essentially to find and/or write kids' craft tutorials. For a little over a year, I've been going through all the submissions we get and deciding if they are appropriate for our site. If so, then I rewrite as necessary to clean up the text, add the image, tag it with search terms, and schedule it, making sure to balance submissions to reflect seasonal interest, different ages, etc. At the beginning of the summer, my boss (the amazing Amanda Formaro) asked me to take on a few more responsibilities. In addition to what I was already doing, I am now going through all the tags on the site to clean them up, then creating round-ups of crafts by theme or material. Like any new task, it was overwhelming at first, but now it's my favorite part of my job. 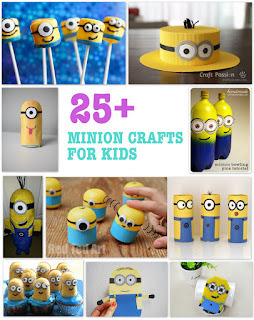 The first round-up I did was Minion Crafts. After cleaning up the tags, I chose my 10 favorite projects submitted to Fun Family Crafts, wrote about each project, linked it to appropriate site and then created a graphic. It was hard picking just ten. Minions are so cute! 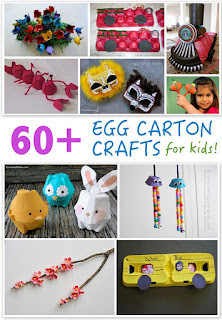 Next up was Egg Carton Crafts. 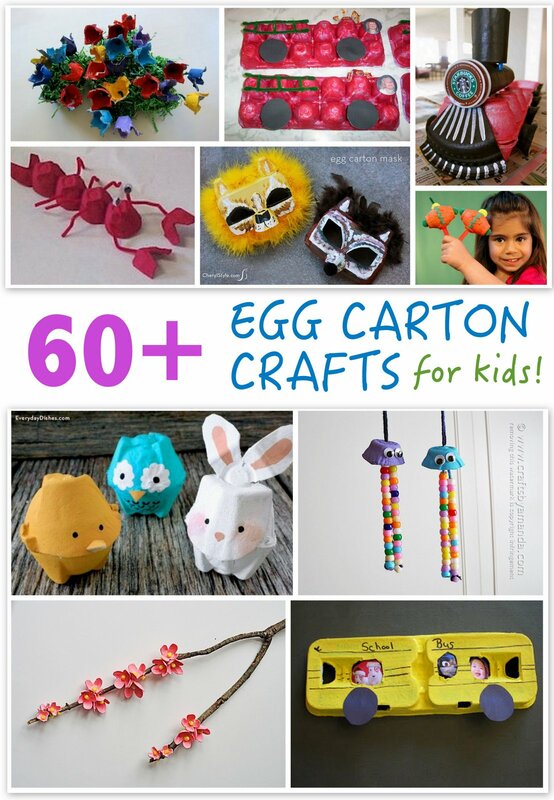 My goal was to show as many different uses for an egg carton as possible among the ten I highlighted. 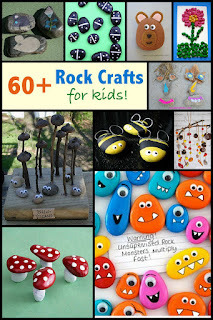 And even though there were some very cute versions among our 60+ crafts, I skipped right over the expected caterpillar crafts and chose more unique projects. Then Back-to-School Crafts. 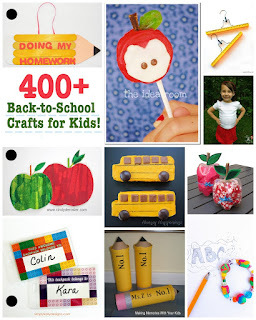 I was really surprised to see that we have over 400 on Fun Family Crafts! Next, crafts made with rice or Rice Krispies. I chose five of each to highlight and it was tricky narrowing it down. 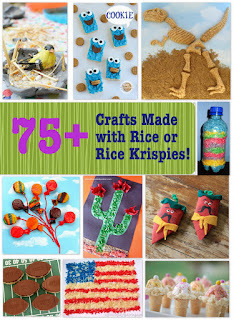 There are some really cool rice crafts! 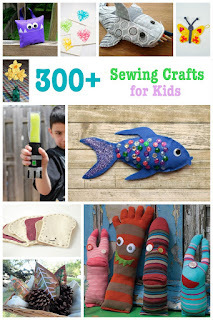 It took quite some time for me to separate out all the sewing (vs. no-sew) projects at Fun Family Crafts. But now the tags are all cleaned up... at least until someone submits something incorrectly again, which happens pretty often. 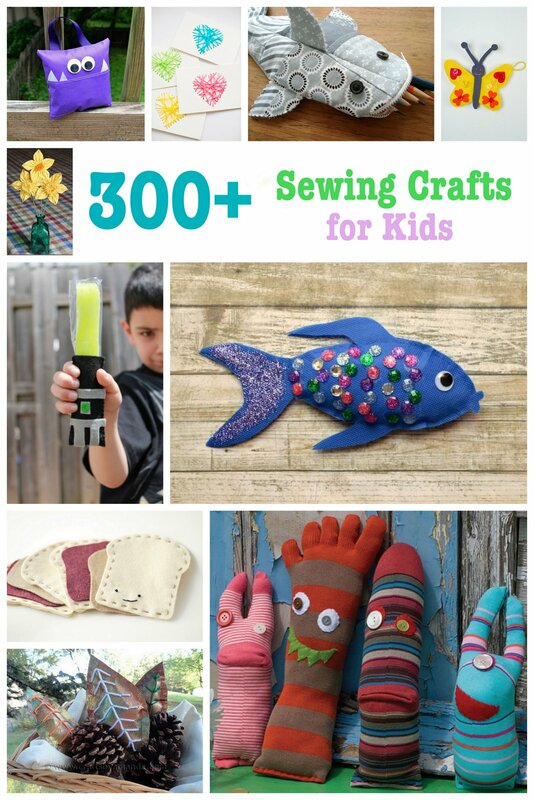 We have more than 300 sewing projects for kids. Making the Hat Crafts round-up was a lot of fun. 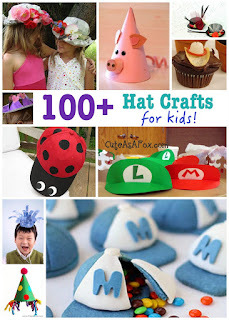 I was surprised how many edible hats we had, like the baseball cap pinata cookies and the cowboy hat cupcakes below. 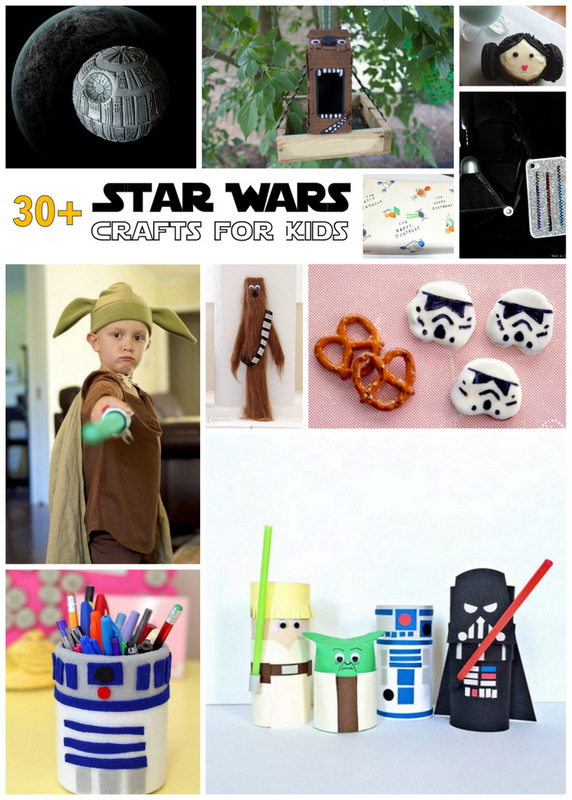 We also have a lot of Star Wars Crafts. Sigh. 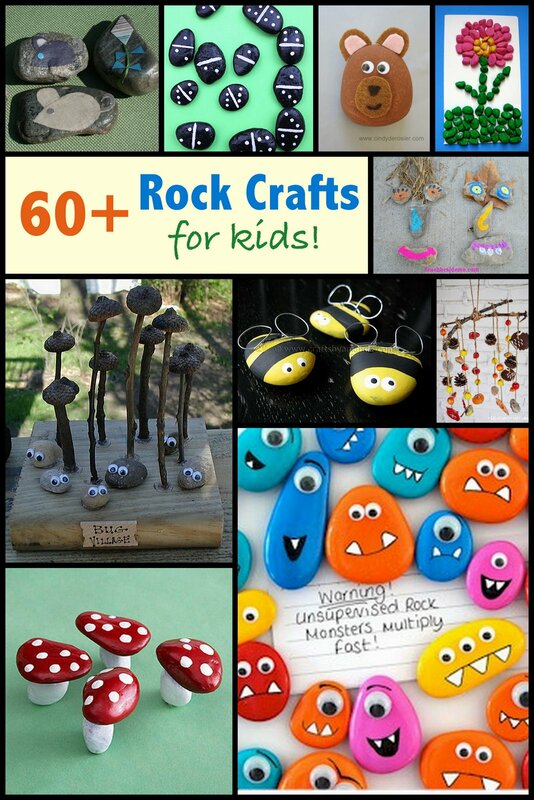 Every once in a while, I choose one of my own projects as part of the top 10, like the bear pet rock in this Rock Crafts for Kids round-up. 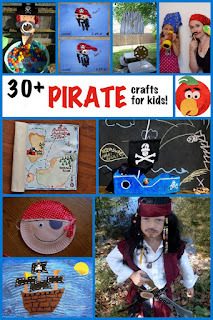 I really enjoyed putting together this round-up of Pirate Crafts for Talk Like a Pirate Day. I'm working on more round-ups to tie in with special days, seasons, and holidays, as well as ones based on specific materials used. You can see all of our round-ups here and our Special Days compilations here. There is something for everyone! Which reminds me... if you ever need a craft and can't find an idea here or at Fun Family Crafts, just let me know. I'm happy to see what I can design. I do love a good challenge! Do you remember the Colored Rice Leaves craft I made a few weeks ago? I loved how they looked, but they were too fragile to use as I'd intended. An anonymous commenter made a great suggestion: Try setting the wire and rice on parchment paper, pour white glue over the rice, let it dry, then peel it off. So that's (almost) exactly what I did! Step 1: Form a leaf from the wire and glue it to a piece of parchment paper. Spread a thin coat of glue in the leaf and then pour colored rice over that. Let it dry completely. Step 2: Brush off any excess rice. Then flood the top of the rice with glue, taking care to stay inside the wire. Uh oh. It turns out that colored rice both swells and bleeds when it is flooded with glue. Not a problem. Just wipe up the excess. Or avoid the problem in the first place by adding layers of glue slowly over time. Step 3: When the glue is completely dry, gently peel the leaf off the parchment. Step 4: Use microtip scissors to trim the excess glue from the edges. This might not be an issue if you add the glue in layers rather than flooding it. Now you have a durable, shiny, colorful leaf! So pretty! "The berries are small, round fruit, about the size of marbles or cherries. 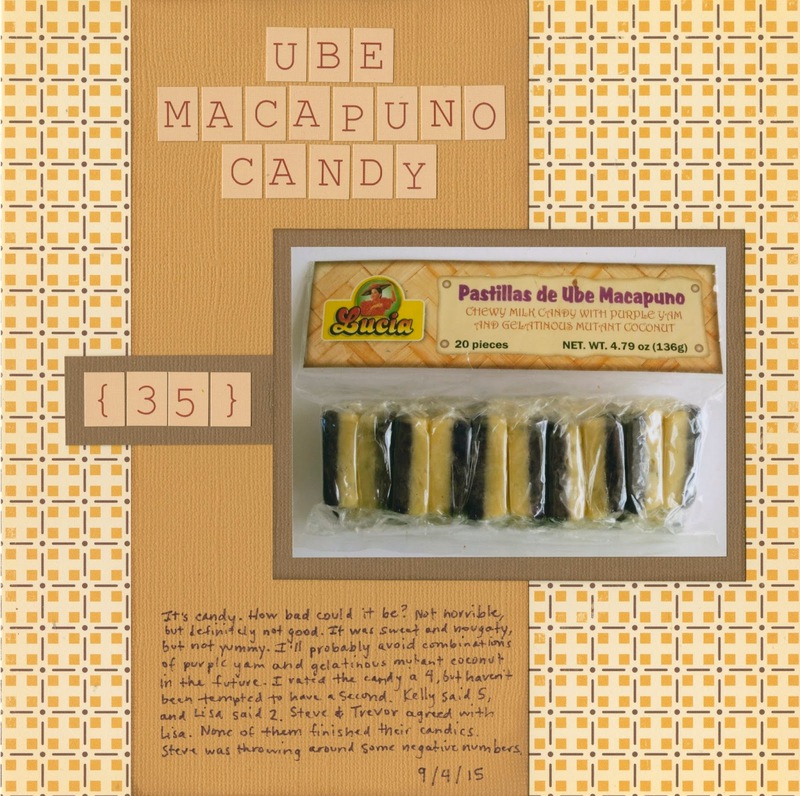 They have smooth, waxy skin that ripens from green to orange or yellow. Inside, the fruit is sweet and juicy, with many small yellow seeds. Pichuberries grow inside husks that assimilate small lanterns, as tomatillos do. 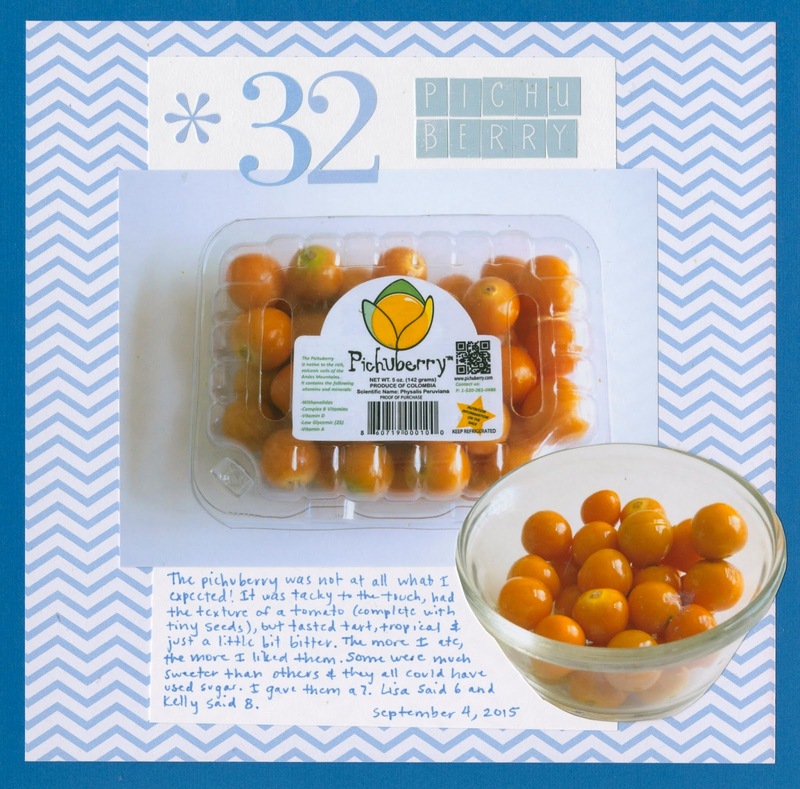 In fact, the Pichuberry® fruit is sometimes associated with Ground Cherries and many people think they come from the same plant. The difference is that the fruit of the Pichuberry® plant (Physalis Peruviana) has a different flavor and grows differently than the Ground Cherry." Expect to be hearing a lot about the Pichuberry in the next year. I get the feeling that it's the next acai berry, in terms of popularity. So how was the Pichuberry? Not what I expected! It is not a typical sweet berry. Instead, it has the texture of a cherry tomato and a very tart, yet pleasant, taste. The first was quite a surprise and I wasn't sure I liked it, but the more I ate, the more I liked it. I rated them a 7. My tasting companions Lisa and Kelly rated it 6 and 8 respectively. Registration for the Craft and Hobby Association Mega Show opens today and I am so excited! The show isn't until January, but I've been making plans for months already. Even though it will be my third time attending the CHA show, it's my first time registering on Day 1, which should greatly improve my chances of getting the classes and workshops I want. Last year, my CHA membership didn't go through until mid-December, so many of the classes I wanted had been full for months. I've been pouring over the Show Preview Guide, trying to fit in everything I want to do. As is always the case, I'm going to have to do a lot of prioritizing, as some of the most interesting and/or useful classes for me conflict with each other. Why is it always like that?! SEO and Blogging...What the Heck is Google looking for? If you are blogging, having a content calendar and posting strategy are not enough to make it onto the first couple of pages of Google. What is Google looking for anyway? In this session, Theresa Cifali and Ann Butler will share the top 7 things that Google wants to see on your blog, what that means and how it effects your rank. They will also share strategies to improve your posting, as well as tools to help you achieve your goals. In three hours, we’ll cover the basics of search engine optimization, analytics and AdWords. This intensive session will help you boost your web presence in organic search results, help you understand who is visiting your site and help you navigate paid advertising on Google. We’re going to cover each topic for about an hour with the goal of showing you what’s critically important to know and giving you the fundamentals of how to approach each area using real world examples. Create a beaded ring using Clover’s Mini Beading Loom. Learn how to warp the loom, weave beads, remove the ring from the loom and understand finishing details. Take home the Mini Beading Loom and material needed to complete the project to make it again with customers in your store! Attract Opportunity: Jump Start Your Brand! In this action-packed hour, learn how to boost your brand and blog to become a go-to site for general market readership. Kathy will share her personal, successful tactics for attracting new business opportunities, time management, time boxing, brainstorming content, working with general market brands, social media reach, personal branding, media kit and more. This is a seminar for those who are serious about strategizing a creative roadmap for their business and are ready to put in the time to take action. Bring a pen and paper to take lots of notes! Learn about why you should work with bloggers, best practices, and how bloggers can compliment your marketing plan in this panel discussion. Panelists will be from various sectors of the industry, from experienced bloggers to manufacturer representatives who work with bloggers. As you can see, most of the classes I'll be taking revolve around blogging, branding, and other business-related topics. While not as fun as hands-on crafting workshops would be, they're arguably more important to get me where I want to be and certainly areas I need to strengthen. Besides, I'll be spending 3 full days on the show floor doing make-and-takes at every booth that offers them. No shortage of crafting for me during CHA 2016! Imagine you're planning a dinner party. One of the guests responds yes, but offers to leave before the meal is actually served because she has just started an extremely limited diet and doesn't want to be a bother. She emphasizes that it is VERY limited and no one else would enjoy the meal if they had to eat only what she can eat. What would you say? Offer to make something different for her? Suggest she bring her own food and stay through dinner? Thank her for offering not to ruin everyone else's meal and let her leave early? If you know me at all, you know that I LOVE a cooking challenge. I insisted she tell me exactly what she could eat and told her to plan to stay through the meal. I started brainstorming. My goal was to make something that everyone would enjoy and that would not feel like we were being deprived. Seeing as how I could (and practically do) live on bread and cheese and sugar, it wasn't easy! I should add that it was a very hot day, so my go-to of soup wouldn't have been a great choice. It definitely felt weird not serving bread, pasta, potatoes or rice. In retrospect, I should have plated the food differently because there was a big empty space on the plate that is exactly where I would have put a starch. But other than that, the meal was very satisfying! I definitely felt like I met the challenge, which was undoubtedly one of the toughest I've ever done. I can't imagine cooking this way for more than one or two days in a row. Hats off to those who prepare very restricted meals on a regular basis. It isn't easy! County fair season has come and gone, so it's time for my annual fair wrap-up! I'll start with Trevor. He entered 55 craft projects, 10 fine arts projects, his Pinewood Derby car, a tablesetting contest and a collection in two different fairs. Some of his entries were judged Danish, where each person is compared to a rubric and, in theory, everyone (or no one) could get 1st place. Other entries were judged American, where there is one 1st, one 2nd, and one 3rd place winner. He did very, very well. Rather than show his many projects I've already shared here, I'll show two of the projects he made at school. Blue ribbons for both. In all, Trevor got a Judge's Favorite for his Pinewood Derby car, 1st place in the live tablesetting contest and 1st for his collection. His remaining sixty-five items earned forty-three 1st place ribbons, seven 2nd place, and one 3rd. He earned just under $200 in premium money, in addition to the free fair tickets for entering. Like Trevor, I entered items in two different fairs. Because I'm a fair judge, I'm very limited in what I can enter. Obviously, I can't enter categories I judge, so I usually stick with baked goods. 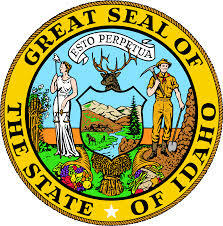 This year, I wasn't able to enter baked goods at one fair because we were in Idaho during the delivery window. 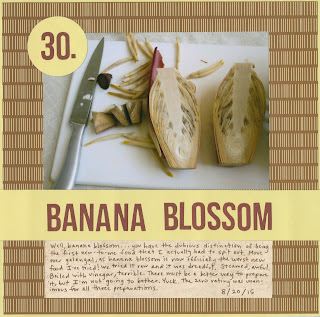 I entered a handful of craft projects that were far outside my judging areas (like the shoebox float, for example), along with the Follow That Recipe Contest, and a collection. All of my entries were judged American. I did OK, earning a few 1st place ribbons, a handful of 2nds and a 3rd. Here's my self-portrait. It placed 2nd in its category. I was happy with that. I earned significantly less money than Trevor did, but it was still a nice bit of pocket change. It probably covered all the tasty fair food we enjoyed during our multiple visits! As much as I love finding the items we entered at the fair, I love seeing what others have entered just as much. There is so much talent and creativity out there. As a judge, I get to see a small fraction of what is entered, so I try to take in as much of the rest as possible when I return as a fairgoer. I take a lot of photos and carry a notebook in case inspiration strikes. Often, Trevor and I see a project that we want to try together. A good example would be the Handprint Campfire that we made during Project CAT. To wrap up the 2015 fair season, I'm going to share my favorite projects from each of the two fairs I visited. First up is this collection. Can you tell what it is? It's a rock collection! I thought this was so incredibly clever. The dinner roll! The butter! The peas and carrots! The wine! It's simply adorable and so creative. Notice that it received a 2nd place and a Judge's Favorite. That baffles people sometimes. How can something be the judge's favorite if something else scored higher? Easily. The scoring is based on strict percentages and something that is more complete, made more perfectly, or (in the case of a collection) more informative will score higher, even if the judge actually prefers something else. These pigs were my favorite thing at the other fair. Aren't they so cute? And so clever! I'm pretty sure this is the first time I've seen a baby bathtub used as a craft item. Bravo! The deRosiers are already looking forward to the 2016 county fair season! After using the Twisteezwire for the colored rice projects last week, I made this little guy. I'm quite fond of him. I used one 30" Twisteezwire to make the body and two wings (about 14" for the body and around 6" for each wing). After forming the wings, I twisted them securely onto the body. Next, I cut 2 pieces of cream wire, approximately 3" each. I threaded each wire through a small and large button, then through the button that makes the beak and twisted the two ends together. I attached each outside end to the junction where the wings and body meet. Finally, I cut two 2" pieces of orange wire and attached them to the body with a cow hitch knot (aka lark's head knot - thanks, Google!). I snipped them off to a length I liked. I think I might hang him up with fishing line so that it looks like he's swooping. The 29th food in my 43 New-to-Me challenge was Sunflower Seed Butter. 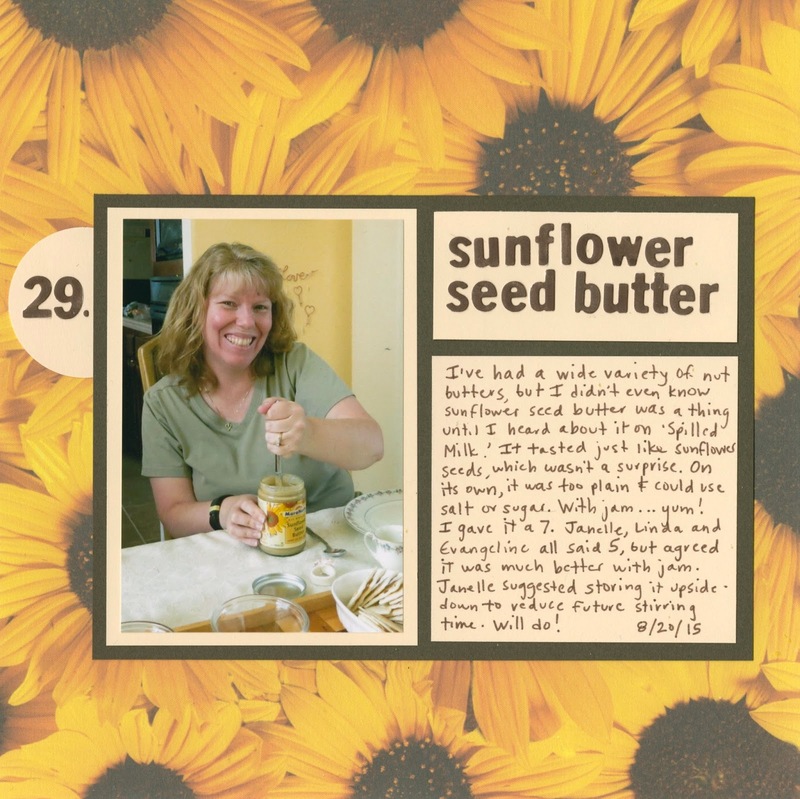 I've had a lot of different nut butters over the years, but I'd never even known that sunflower seed butter was a thing until they tasted it on Spilled Milk. So I went looking for it and found it without too much effort. 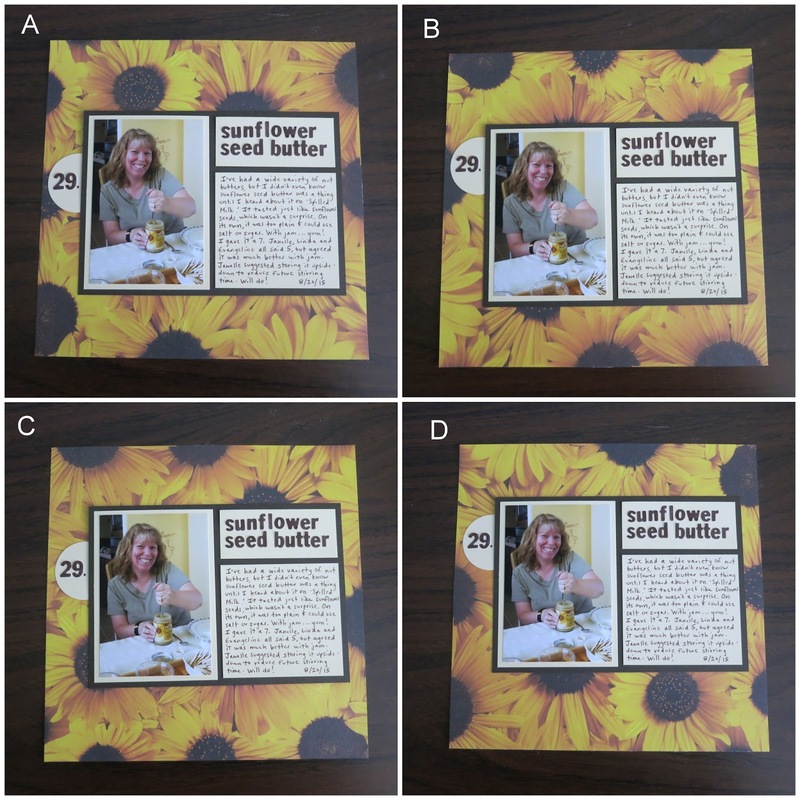 When I went to make the layout, I remembered that I had a piece of photo-realistic sunflower paper from eons ago. I glued my photo, title and journaling to a dark brown mat. I placed the mat on the sunflower paper and snapped a quick picture. I repeated this three more times, rotating the background paper 90 degrees each time. Here are the four different versions. Which would you have chosen? I eliminated Option A first. I don't like the way there is a blank space in the bottom right corner. It looks off-balance. Option B was out next. It seems a bit top-heavy, plus the sunflower to the left of the number is competing with it. I debated between Option C and Option D. Ultimately, I thought one of the two did a better job of drawing the eye where I wanted it. 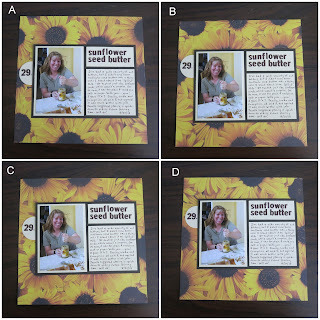 That choice was Option C. I like the sunflower center that sits directly above the title, drawing the eye in and forming a visual triangle with #29 and the large sunflower center on the bottom right. I should mention that Janelle took that photo of me a good 5 minutes after I started stirring the sunflower seed butter, trying to work the oil that had separated back in. It was hard work! I'm storing the jar upside down in the fridge now so I don't have to spend that kind of time stirring in the future! 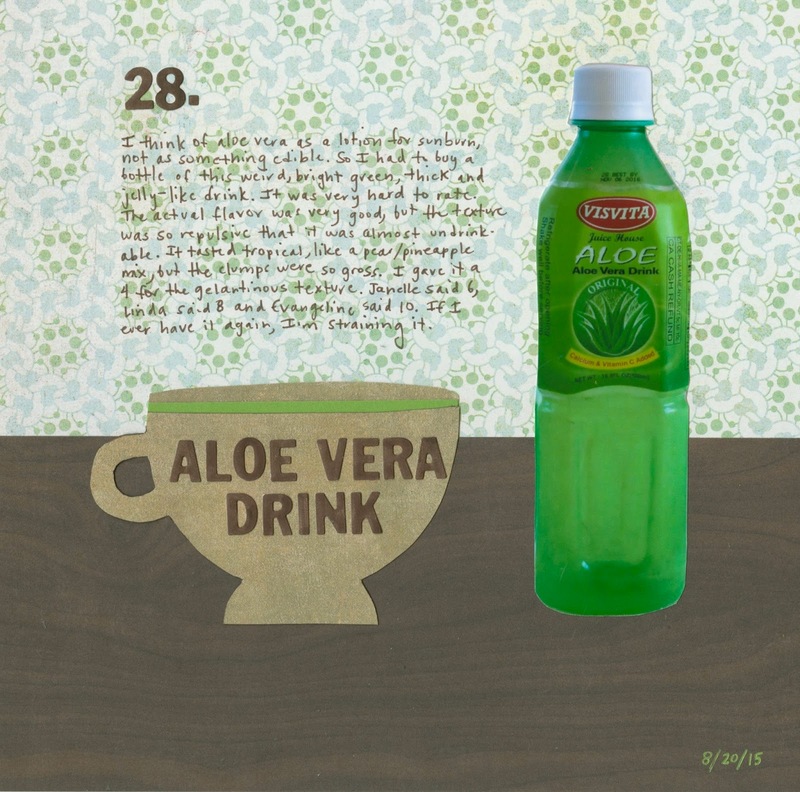 Growing up, aloe vera was something I put on my skin to soothe sunburns. I got burned a lot, despite my best efforts not to. Anyway, in my mind, aloe vera is a lotion, not a beverage. So I had to buy some and try it as part of my 43 New-to-Me project. I think this was the hardest to rate of all the new-to-me foods so far. The taste was actually pretty good, but the gelatinous texture was so off-putting that I had great difficulty finishing my small sample. Like kombucha, the aloe vera drink is something I'd drink again... but only if I filtered it first. I gave the aloe vera a 4. My friends didn't mind the gross texture, rating it 6, 8, and 10. Trevor agreed with me. ("It tastes good, but why is it so gloppy?"). Steve declined a taste. I had some fun scrapping this page. I'd served the samples to my friends in tiny little teacups, so I decided to cut one out to hold my title. It's completely out of proportion with the bottle of aloe vera drink, but I like it. I've never tried to cut a teacup free-hand before. The handle is a little lopsided, but I was happy enough with my first attempt that I stuck it to the page. In retrospect, I should have followed the Rule of Thirds and used a smaller strip of woodgrain to balance the layout better. Oh well. It's been enjoyable trying new things for this album and not really caring how each page turns out.